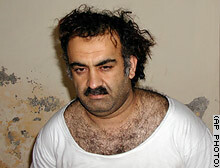 Time once again for more PhotoShop fun, this time the subject being alleged 9/11 mastermind and media darling Khalid Shaikh Mohammed, or as I like to call him, Steve Shaikh Mohammed. Basically what happens is I pile on image after image created from one picture. The result: a steaming cup of hilarity.